Getting a life and keeping a life once you do get it. Coping with chaos and change. Getting through the “dark nights of the soul” in life and business and what they are all about. What you and your employees need to know about doing business in the 21st Century. Why you absolutely must have more than an oar if you are to survive in permanent white water change. 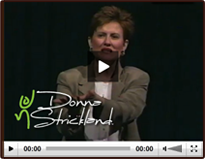 Donna will work with you to customize this two-hour seminar to the specific needs of your team or organization.